The 2019 Audi Q7 is a 7 passenger Automatic transmission, 4x4 Sport Utility Vehicles. It is available in 3 trim packages, the Premium, Premium Plus, and Prestige. The new Audi Q7 invoice price ranges from $50,337 to $56,353, while MSRP ranges from $53,550 to $59,950. 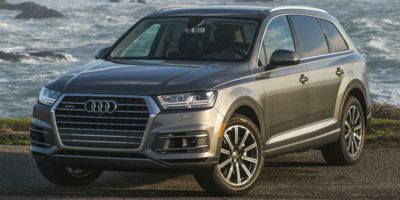 The 2019 Audi Q7 is available in 9 exterior colors, Carrara White, Cobra Beige Metallic, Florett Silver Metallic, Galaxy Blue Metallic, Glacier White Metallic, Navarra Blue Metallic, Night Black, Orca Black Metallic, and Samurai Gray Metallic, and 6 interior colors, Black, Cedar Brown, Murillo Brown, Nougat Brown, Pistachio Beige, and Rock Gray.